difficult one. I would use all your colours as your main stripes and perhaps use a soft navy or a soft charcoal grey for the narrow stripes. I'm leaning towards a soft charcoaly colour as I think that it would blend well with the other colors (...and I love grey...) but a soft Navy would perhaps give it a bit more pop. I look forward to seeing what you finally decide. I like the soft colors, but think you need a contrast for the accent stripes. What color will you use for the neckband? I don't care for the selection in the picture and think it should be the contrast color to tie it all together. Look forward to hearing your decisions. Tough questions. 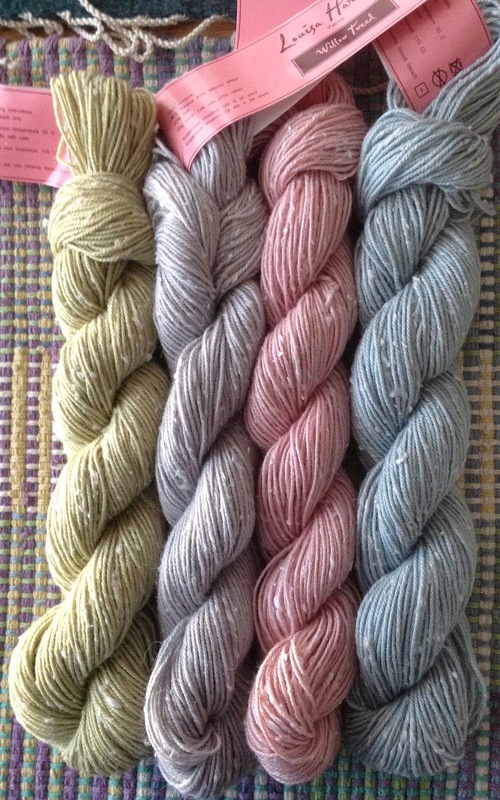 I kind of love all of them as major, they skeins are gorgeous!